Sourced from the finest sustainable tree plantations in Indonesia, our 24 Bottle Compact Cellar Cube is now more durable, more beautiful and more eco-friendly than ever before. Classic modular style wine rack that holds up to 24 bottles of your favorite wine. New and Improved--Stronger in Mahogany! Sourced from the finest sustainable tree plantations in Indonesia, our 24 Bottle Compact Cellar Cube is now more durable, more beautiful and more eco-friendly than ever before. Hand-cut and hand-sanded for a remarkably even color and grain. The strong, smooth wood shows less blemishes and is built to last. Classic modular style wine rack that holds up to 24 bottles of your favorite wine. Compact cube shape is great for small spaces because you can stack them high or side by side to get maximum storage. 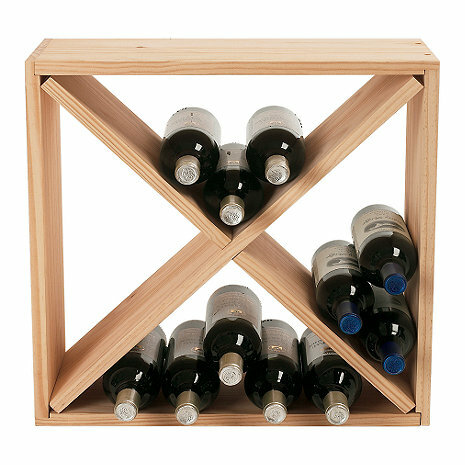 BEST ANSWER: The 24 Bottle Compact Cellar Cube Wine Rack (Natural) requires minimal assembly. Yes. It comes in pieces but is pretty easy to put together. No but it was easy to put together. Yes, but it's easy to assembl. Does anyone know how many sparkling wine bottles this would hold? BEST ANSWER: There are several different shapes to sparkling wine bottles, but think it would hold 24. there is quite a bit of extra room when putting 6 Bordeaux and pinot bottles in each of the 4 compartments. Hope that helps. Depending on the shape of your bottle it could be between 12 & 16 bottles. Is this wood unfinished? I would like to stain it to match our bar… would I be able to do this with this wine cube? Thank you in advance! BEST ANSWER: The finish would need to be sanded down to the natural finish before staining, there is a gloss finish on the rack currently. Yes this can be stained to match. BEST ANSWER: The wood used in the wine rack is mahogany. How many cubes can be stacked on each other? BEST ANSWER: Two or three cubes can be stacked , over three I would suggest that you also attach to the wall for stability. (1) Is this wine rack sturdy enough that it could be mounted on the wall? (2) Can the "natural" would be stained? BEST ANSWER: 1- Yes the rack is sturdy enough to mount, but would not recommend stacking one on top of each other. 2- The finish would need to be sanded down to the natural finish before staining, there is a gloss finish on the rack currently. I had moderate expectations with these storage cubes, but needed additional storage and was looking for a bargain. What I got was unexpected. These storage cubes were easy to assemble, extremely strong and very attractive. The quality of the wood is very high and looks wonderful among the rest of my wine storage. I was so impressed with the first two I purchased, I bought more and then replaced all my other wine storage shelves with ones from the same collection so all would match. I do recommend them for the times when you purchase whole or half cases of one item since the bottles do stack on top of each other, so if you are storing several different wines together, this isn't the best product since you'll need to do a lot of shuffling around to find the bottle you're looking for. I stacked two of these cubes in my hall closet (they were incredibly easy to put together and I had them placed where I wanted in less than 45 minutes). They fit perfectly and, as a result, I now have a wine closet! My friends and family are quite impressed and several have commented that they are interested in purchasing some of their own. The cubes are easy to assemble and stack nicely. I have several large format bottles of red wine that do not fit in my wine cooler. The cube wine rack is the perfect solution- it holds up to 3 large bottles in each slot and fits nicely under my sofa table. The cubes go together easily and look great. They add a little class to my wine closet. I have several of these. They are built rock-solid, look great and allow me to keep varietals together as my cellar "ebbs and flows". You can stack them four high, easily relocate them and make optimal use of space in corners. Love them. I use this to store everyday wines that I purchase by the case that don't need aging. Provides easy access. A great simple storage rack. No problems with my delivery, both units arrived quickly and in good condition. Better than I had hoped for. Fit the bill perfectly. Arrived quickly and packed well. Glad that I purchased it. Great, functional wine rack. Provides storage for 24 bottles with minimal space. Delivery was prompt and actually arrived ahead of the scheduled time frame and in undamaged condition!!!! We now own several of these cubes. These wine cubes safely hold 24 bottles of wine. We were able to rearrange a pantry to perfectly accommodate a total of three of the cubes and we could not be happier. They are very sturdy and attractive as well. Dale, a big wine enthusiast. I purchased these cubes for a small entry closet I was converting to wine storage. These fit perfectly, are very attractive, and hold the wines securely. They were everything I was hoping for and more. The finish is a little shy in some areas, but in a closet this won't matter. Nice quality, easy to put together. Nice quality, easy to put together, exactly what I wanted. Web site continually says order is "In Process" and will be shipped "Today"
The web order information page was worse than useless, it was misleading! This was my first and last shopping experience with Wine Enthusiast. Very pleased with the quality and appearance of this product. My husband needed storage, as he has recently been purchasing larger quantities of wine, but not yet ready to build a cellar in our home, and these have met our need perfectly. They stack nicely, were extremely easy to assemble, and are attractive and durable. We will definitely be purchasing more in the near future! The simplicity and size of these cubes make them very flexible in filling out space in my wine storage area. They stack well, and I have easily modified to make shelves in a few. Have 10 total that work really well for case and partial case storage. Assembly was a piece of cake! I read the concerns about assembly and am wondering if they had a bad batch, because the assemble was very easy. Everything lined up perfectly. It is very pretty. The edges on the interior cross hatch piece was a bit unfinished looking, but I rubbed it with ole English scratch cover and it looks great. We bought it as a gift for our son who can use just one on the frig, then build it as big as he wants over time. A solid way to build a cellar! Sturdy and easy to assemble these cubes reliably stack to a height of three cubes stable enough to build a relatively inexpensive wine cellar. The "24" bottle capacity is a bit misleading as some larger (still 750ml) bottles don't fit well and only 5 can be placed in one of the four quadrants, but this is a minor problem. Overall these are great and my cellar is filled with them, and I just keep adding more. Overall, I am very pleased. The rack looks mice and looks like it will take stain well, although we have not stained it yet. It is sturdy as well. The only negative (and the only reason it got 4 instead of 5 stars) is that the assembly, while intellectually straightforward, can be difficult due to imprecisely pre-drilled holes. Some of the screws/pegs take some pretty significant effort to assemble. I am just starting a collection and I found this to be a decently priced, decent quality item that is good for basic wine storage. I put it in my cellar on a shelf and it's sturdy and seems like it will last a long time. I bought it because it holds different sized bottles and has plenty of room for the number of bottles I want to keep at any given time. It was moderately easy to put together, the instructions are not very good, but you don't have to be a rocket scientist to figure it out if you take your time and don't rush into it. The only complaint that I have is that the holes where you insert the bolts were drilled a bit too close to the edge of the wood and I cracked the wood on just about every hold. I doubt this will be a problem,since the rack doesn't move around a lot, but it could be for some people. Easy to assemble - the wood is clear and of good quality. Great for wine cellar but nice enough to display as well. This type of rack is great to store different size wine bottles in a secure manner. It's just right for me. Product arrived promptly in a box with a neat little handle on the outside for ease of transport. I use these to store the wines that I bought. It certainly holds 24 bottles without problem and it is a space saver. However, there is no backing on the cube, it is worrisome that bottles may slip out. The other thing is that you need to stack bottle carefully. It is good for store same type of wines, but not so good for display different type of collection. I ordered two of these in conjunction with one matching larger rack. The larger rack arrived on time, but the two smaller ones were backordered for weeks. When they finally showed up, they were not really made to match with the larger unit, from a size standpoint. The two smaller racks are about two inches short of matching with the larger unit. That works fine for me, but you should be aware, if you want it to look like one unit. Decent product. A little annoying to assemble as the screws didn't always line up easily, however we knew that from another review and bought it anyway. Easy to store many bottles in a small space and it is sturdy. While functional, I was truly disappointed by the quality of materials and workmanship, specially given the price. I suggest more attention to materials and workmanship. We are expanding our cellar and purchased two cubes to add to the two we bought earlier. The assembly didn't go well - the dowels didn't fit and the wood spilt at the point of the dowels on three sides. The cubes we bought earlier from WE were made from solid pieces and the new ones are not solid. We haven't assembled the second cube yet so don't know if this one is a fluke or if the design is just poor. We were looking for utility and not appearance but the damaged wood would not be acceptable for display. I am using the wine storage for upstairs off the kitchen for extra wine holdings especially during the holidays. We have wine with every meal. JUst moved and needed to assemble wine storage. Had previously used similar cubes. These were put together better with screws and dowels, not just nails. Very sturdy to stack in closet or standalone. have 4, ordering 7 more now, more later..